I have a shameful secret: I watch NBC’s ‘The Voice.’ In fact, to come entirely clean, I guess I should say, “I faithfully watch ‘The Voice.’” The revelation of this guilty pleasure would come as a surprise to people who know me because of both my specific contempt for “reality TV” and my more general disdain of formulaic dreck. Ironically, ‘The Voice’ is both – in spades. Apart from the musical performances, there is a surfeit of contrived drama: the competition and bantering between the judges, and the often cloying back stories of the performers. Ugh. But there is no curious conundrum to resolve here: I like ‘The Voice’ despite the fact that it is unabashedly formulaic reality TV (a sin that technology helps me minimize). For those of you who don’t know it, ‘The Voice’ is a singing competition. And I happen to be captivated by musical talent. I get completely floored by a 14-year old girl with the vocal timbre of Billie Holiday or Amy Winehouse and am left slack-jawed by the burly former linebacker with the range and falsetto of Philip Bailey. But it’s not just the surprise of those incongruities. For me, it is almost exclusively about the quality of the performers’ pipes and, occasionally, the musical instincts and insights of the “superstar” musicians who first judge, then coach, the contestants. Now, I suspect that my television viewing habits hold your interest just about as much as my love of pudding, but there is a substantive point behind this confessional. Useful lessons about trial presentation and persuasion can be learned from ‘The Voice,’ which first aired in 2011. First, some background. ‘The Voice’ is a complex, intensely dramatic version of the old-fashioned talent show. At the end of each season, one singer, drawn from the ranks of thousands of Americans who believe they have musical talent and have entered the competition, is crowned the winner and signed to a recording contract. The show uses a distinctive format. The competition is guided and run by four recording stars (alternatively referred to as “judges” and “coaches”), each of whom selects and mentors members of his or her team all the way to the finals. 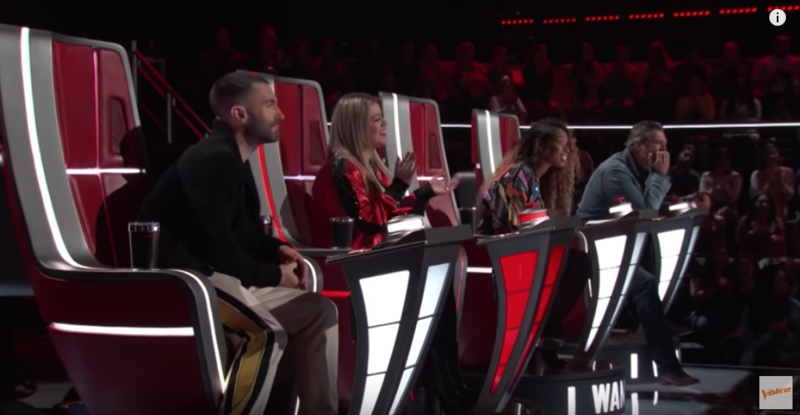 The first round, aptly titled “the blind auditions,” features performers singing to the four recording star judges, whose chairs are mechanically turned away from the stage during the performance. Isolating the singular feature that gives the show its name, it is the voice alone that determines whether a performer will advance – not physical appearance, stage presence, dance moves, or swag. Tasked with putting together a team of 12 singers, a judge “votes” for a compelling voice by pressing a button that turns his or her chair to face the stage (and the as-yet-to-be-seen performer) before the end of the performance. Contestants for whom no judge turns are eliminated. A single “chair turn” puts a contestant on the team of the turning judge; but multiple chair turns shift the power dynamic, transforming the turning judges into competitors lobbying for the desired contestant, who gets to pick which team to join. Once 48 contestants are selected – 12 for each of the four coaches’ teams – “battle” and “knockout” rounds follow. In both rounds, coaches pair two of their contestants in dueling duets and separate solos, respectively, and are forced to choose, with occasional insights from the other commenting coaches, a winner of each head-to-head competition as a means of winnowing their teams. Coaches can “save” one member of their own team who would otherwise be eliminated and “steal” twice from the discards of another. By the end these rounds (and accounting for saves and steals), each team is left with six members – all of whom were selected by the coaches – expert in the field of musical performance. In the remaining rounds, a significant change occurs: the viewing audience – voting by text, social media, and iTunes purchases – replaces (first, mostly; then, entirely) the professional coaches/judges. Specifically, in the “Playoff Round” – which results in the reduction of each team from six members to three – the “voting” public picks two of the members and the coach picks the third. Thus, each team enters the “Live Finals” with three members. From there on, coaches/judges have no say in who proceeds, and team membership plays no role. The 12 remaining performers compete against each other in a series of live broadcasts, with the viewing audience voting online for their favorites. Each week, the singers with the fewest votes are sent home, until only one artist remains. That person is declared the winner and receives a recording contract and a cash prize. More often than not, the most exceptional voice – ironically – fails to win ‘The Voice.’ And why that is the case is at the heart of my thesis about what ‘The Voice’ can teach trial lawyers. At bottom, it’s all about who is deciding. To win ‘The Voice,’ a contestant must ultimately win over the hoi polloi (the voting members of the show’s following), and not the elites (the musical superstar coaches). Nuanced and brilliantly eclectic, Judith Hill was a one-of-a-kind boutique find in what turned out to be a Walmart world. Call me an elitist, but this was the crux of my disappointment in a show whose title promises a superlative, but whose execution virtually guarantees the achievement of something less. What it takes to succeed with subject matter experts adopting a singular focus is quite different from what it takes to win over an essentially unskilled TV audience fed a diet of (at times cloying) back stories of the contestants. Just as contestants on ‘The Voice’ must manage the transition from being judged first by experts, and eventually by laity, so must the trial lawyer. I will develop these similarities in my next blog post or two. Subscribe free here to be notified of subsequent blog posts.